Katherine Kennedy announced as 2014 ResSupport Fellow. Photograph credit: Mark King. We are very excited to announce that this year, as part of the ResSupport Fellowship programme, ResArtis member Akademie Schloss Solitude (Germany) will be generously hosting Katherine Kennedy, from The Fresh Milk Art Platform (Barbados). This will be Akademie Schloss Solitude’s second time participating in the ResSupport Fellowships. During her three-month stay from September 1 – December 1, 2014, Katherine will be introduced to the different working areas of Akademie Schloss Solitude and gain insight into how this prestigious residency programme is run. With this opportunity, she will learn about Akademie Schloss Solitude’s management, increasing visibility on a global level, and discuss the ongoing challenges of sustainability within artist residencies. She will also interact with other fellows and artists in residence in order to learn about new practices. Additionally, she will attend fellow and staff presentations, as well as make presentations of her own pertaining to Fresh Milk and the Caribbean creative arena to create a cross-cultural dialogue, which will allow all parties to better understand the contexts that Fresh Milk functions within. Akademie Schloss Solitude. Photo courtesy of the Akademie’s press department. We are sure that this fellowship will further initiate exchanges and build relationships within the residency field between the Caribbean and Europe, while also contributing to a more dynamic and sustainable cultural environment throughout the Caribbean. These fellowship experiences enable participants to observe, reflect and utilize various organizational factors, while assuming an active role and a behind the scenes look at the daily work of an experienced member organisation. This experience provides an opportunity to further organisational awareness, strengthen bonds, and facilitate knowledge and cross-cultural sharing among members of the ResArtis Network. See this announcement on ResArtis News. Katherine Kennedy (Born April 4, 1990, Barbados) is an artist and writer. She graduated from Lancaster University, UK in 2011 with a BA in Creative Arts (First Class Hons.) after winning a Barbados Government Scholarship for tertiary education. Her combined major of Fine Art and Creative Writing developed her keen interests in visual and literary pursuits. She has won awards for her artwork and writing in her home country, and exhibited locally and internationally. Her visual practice is heavily tied to a sense of place, and often uses interplay between found organic and inorganic objects to assert cultural identity in different environments. Alongside her work as an artist, she is also dedicated to contributing to the support and cultivation of the wider regional creative space, and currently works as the Assistant to Director with both The Fresh Milk Art Platform, an artist-led initiative and residency programme, and ARC Magazine for contemporary Caribbean art. 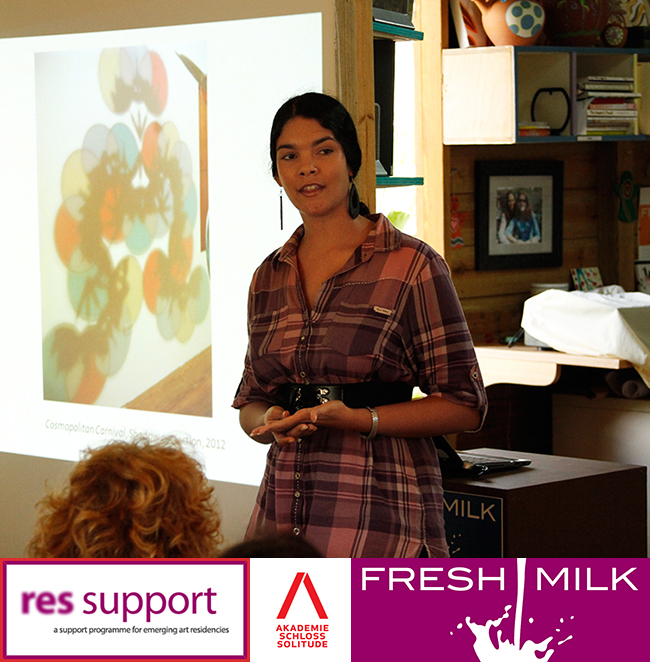 Katherine travelled to the Instituto Buena Bista (IBB), Curaçao in November 2012 to conduct ‘Creatives in Conversation’, a collaborative project between the IBB and Fresh Milk. She received a full fellowship from the Reed Foundation for a residency at The Vermont Studio Center in May 2013. In September 2013, she took part in ‘fresh casa’, a short, intensive mentorship programme at Casa Tomada, São Paulo, Brazil. The Akademie Schloss Solitude is a public-law foundation that offers an interdisciplinary and international fellowship program for artists and scientists. Since 1990, the Akademie has supported artists in the disciplines of architecture, visual arts, performing arts, design, literature, music/sound and video/film/new media with residency and work fellowships. Since 2002, young people from the science and business sectors are also eligible for fellowships with the art, science & business program. The Akademie Schloss Solitude is financially supported by the German province of Baden-Württemberg. ResArtis is an association of over 490 centers, organisations, and individuals in over 70 countries. Each of member is dedicated to offering artists, curators, and all manner of creative people the essential time and place away from the pressures and habits of every-day life, an experience framed within a unique geographic and cultural context. Through Res Artis, organisations will become part of a global community of colleagues engaged in dialogue through face-to-face meetings and virtually through its website. Those interested in attending a residency can use the information and resources on its website, gaining insights into the profiles of members and staying informed about their events and application deadlines.